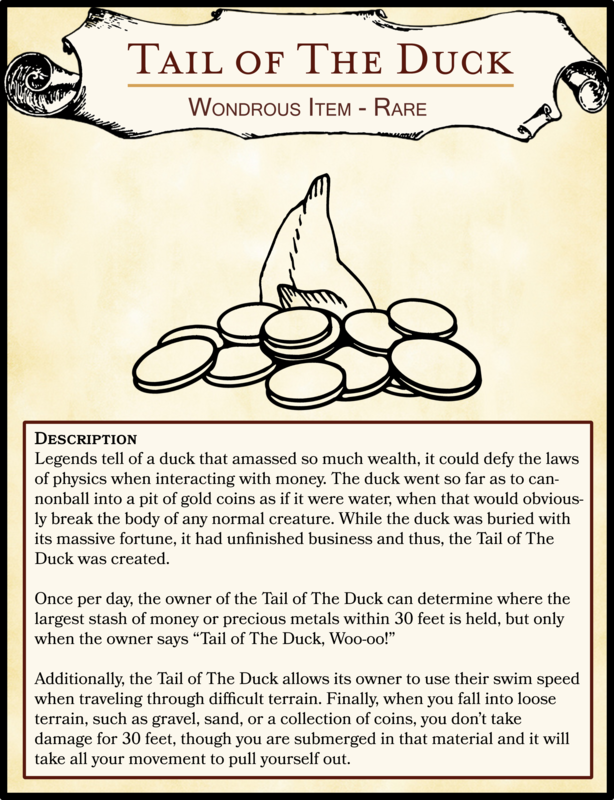 Legends tell of a duck that amassed so much wealth, it could defy the laws of physics when interacting with money. The duck went so far as to cannonball into a pit of gold coins as if it were water, when that would obviously break the body of any normal creature. While the duck was buried with its massive fortune, it had unfinished business and thus, the Tail of The Duck was created. Additionally, the Tail of The Duck allows its owner to use their swim speed when traveling through difficult terrain. Finally, when you fall into loose terrain, such as gravel, sand, or a collection of coins, you don’t take damage for 30 feet, though you are submerged in that material and it will take all your movement to pull yourself out.